When using insecticides, herbicides, fungicides, and other chemicals, it is important to protect yourself and your clothing. Spills from mixing and pouring certain products can be dangerous without wearing safety equipment, also known as personal protective equipment (PPE). 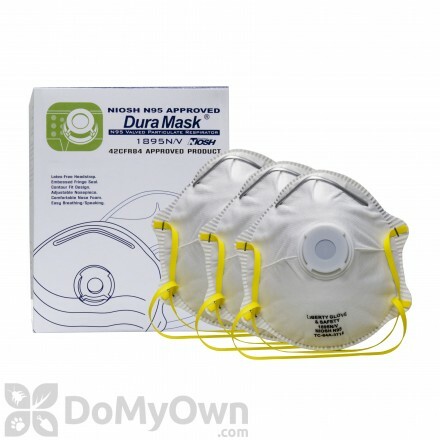 DoMyOwn has a large selection of PPE for almost any scenario imaginable. The Global Vision Eyewear Z-33 Goggles are sturdy, shatterproof antifog goggles. Available in tints of clear or smoke. The Global Vision Eyewear Flare Goggles are shatterproof anti-fog goggles, available with clear or smoke lenses. Remington Solar Chlorine-Free Sun Shock is a purifier that collects undesirable minerals such as calcium and iron from the water of your pool for crystal clear water. 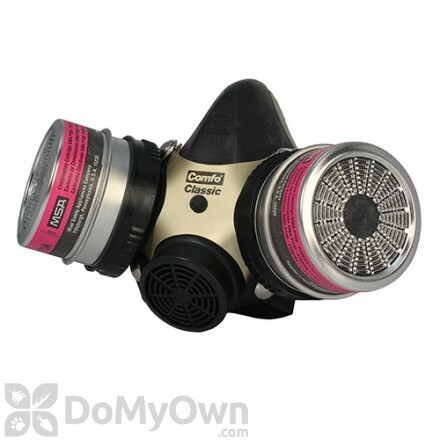 A respirator is vital to keep your lungs and breathing passages safe from pesticides. 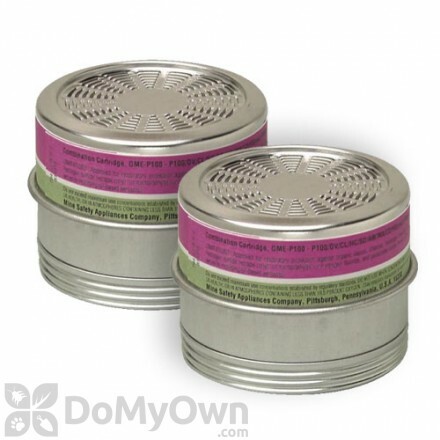 The lungs are one of the most susceptible organs to the harmful effects of some chemicals, and therefore keeping these chemicals from making contact with them is a very important part of safe pest management techniques. 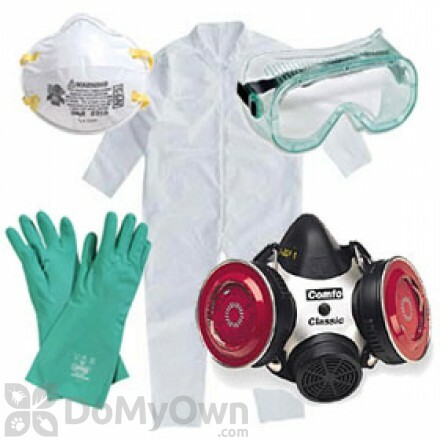 The best products for lung and airway protection are respirators such as the Moldex 2300 N95 valved respirator mask, which provides complete protection from the inhalation of aerosol pesticides. It also is advisable to wear this same sort of lung protection while inspecting the house for pests, as their waste products can easily become aerosolized and cause allergic reactions and occasional disease in those who breathe in the bacteria or viruses contained therein. It is well known that the eyes are prone to irritation and damage from certain chemicals, and when applying pesticides, particularly in tight and non-ventilated spaces they can be in serious danger of damage that can be lifelong. Therefore you will want to purchase sufficient eye protection whenever you are planning to apply pesticides to your home. You best bet is to purchase a pair of plastic goggles that can be worn over any eyeglasses and provide you with an impenetrable barrier to protect your eyesight. Because many of the chemicals used in pest control can be absorbed through the skin and cause harmful effects, it is important to invest in something to go over your clothes and bare skin to keep from experiencing any problems. The best products for skin protection are Tyvek coveralls, which are worn over your clothes and provide complete protection for every square inch of your skin. 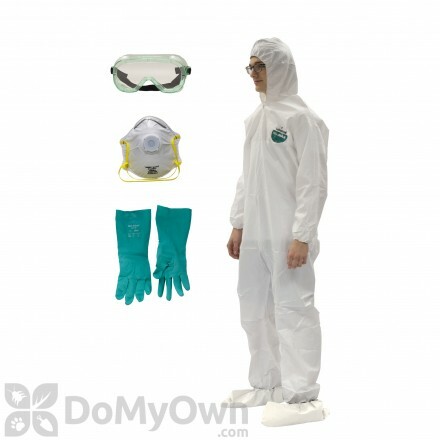 The material used in the manufacture of these coveralls is impenetrable to chemicals but does breathe, allowing you to remain comfortable even if you are applying pesticides in an attic, garage or other similarly unventilated space. In addition to the coveralls, you’ll also want some chemical resistant gloves to keep your hands safe and sound. How important is to me that my home be pest free? Does pest eradication warrant bringing toxins into my home? If I use commercial pesticides, am I putting myself and my family at risk? These questions can be particularly poignant to those sharing their home with children or pets. In order to make a decision about whether chemical pest control is right for you, it is necessary to weigh the risks versus the benefits of using pesticide products at home. In this industry it is not uncommon to receive emails from concerned customers about the risk level of pesticide chemicals. We try to educate people about how pesticides compare with other household products they are already using. For example, do you use toothpaste, shampoo, laundry detergent, make-up, hand sanitizer, commercial cleaners, bleach, ammonia, rubbing alcohol, prescription drugs? Does your garage shelve automobile oil, gasoline, antifreeze, fertilizer or other lawn care products? If you use any of the above products you are already exposing yourself and your family to a large number of potentially harmful toxins. You might respond, yes, but I have been using these products for years and know how to use them safely. And that is precisely the point! Exercising proper safety precautions in using toxic household products does not completely remove the risk of harm. There is always the chance that a child or pet will uncover an improperly stored household product and ingest a detrimental amount. However, practicing safe usage guidelines goes a very long way to drastically reduce the risk of harm or injury. This is also the case with pesticides. 1. Always practice exclusion and prevention. 2. Use natural products when and where available. There are actually quite a few green and all-natural pest products available that do not contain harmful toxins. If one is available that meets your needs, by all means go ahead and try that first! Why use harmful chemicals if you don't have to? Just remain open to the fact that some infestations and certain types of pests may require a more potent elixir of control. 3. If a natural product is not available for the type of pest control you need, or is not doing the trick, a stronger pest poison can be used. Just be sure to read and follow directions give on the product label, and practice common sense. Wear protective clothing as directed on product label, usually gloves, long pants and sleeves, and a face mask to prevent inhalation. Use only the smallest directed amount first. More is not necessarily better or more effective. Space applications properly. More often than directed is also not any more effective. Only apply chemicals when children and pets are out of the space or house, and have them return only when dusts have settled or sprays have dried. Pesticides should only ever be applied to cracks and crevices and perimeters, except where otherwise directed as with furniture or carpet treatments. Do not spray a chemical haphazardly around your home or in areas where food is eaten or prepared. When treating for termites, the pesticide needs to be applied underground, so there is no issue there. If you notice any reactions in family members following an application, whether mild (as in a headache or dizziness) or severe, talk to your doctor or poison control. Even when following the label exclusively, there are still rare cases where chemical sensitivities may exist in a single individual. Remember- Pesticides don’t have to be scary. At the end of the day only you can decide whether applying a chemical pesticide within the walls of your home is the right thing for you. This decision should never be made because a professional pest control operator, landlord, or even a friend says it is the right thing to do. The most important thing is the safety of your family and the comfort of your home. If your pest problems are making home life uncomfortable or posing other risks to health and sanitation, just know that proper pesticide application can provide relief that will improve your peace of mind and quality of life. If you use common sense the way you do when using other common household chemicals, pesticides don’t have to be scary.